Why does advertising cost money? I've read a lot of bloggers lately "bashing" others who choose to have paid advertising (via passion fruit, or other sources) on their blog. This got me thinking, naturally (as well as a bit peeved). A lot of people don't understand advertising and why it should cost money. First of all, when you purchase an ad on a fellow blogger's page, or a site--they are sending their clicks to you. Someone might click on their site, see your button, and click over to your page. This person might never return to the site where they saw your button. When you buy a sponsor spot, you are paying that person to send their visitors to you. Now, I spend a lot of time on my blog. I enjoy my readers and their feedback. If I'm going to have your button on my site, and potentially send visitors your way, then I deserve to be compensated for that. Second, when I pay for advertising, there are perks that come with it. For example, a few months ago I bought one of Rachel's ads. Rachel tweeted many of my blog posts as well as linked some of them in her own writing. She spent some of her personal time promoting my blog. And well, time is money people. There is nothing wrong charging for it. The Random Writings--Very small section of ads allowing yours to stand out. Also links your posts in her own blogging. Delirious Rhapsody: Does weekly post featuring a link of her choice from your blog. Very friendly--always posts on your blog and leaves very personal and thought provoking comments! Ads on both sidebars and spaced out cleanly. Discovering Simply Me--Offers large ad space for swaps. Always replies to e-mails and tweets a ton, very friendly! Oh Whimsical Me: Offers only swaps right now, three different large sizes and extremely cute website, very professional. Wifessionals: Super nice blogger! Lets you guest post, tweets your posts daily and gives great blogging advice! 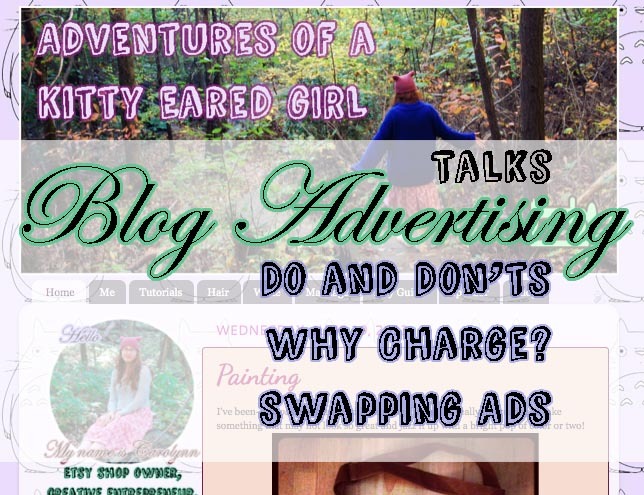 I love bloggers that have large swap ads. 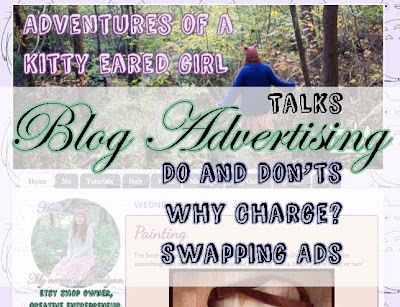 I usually swap with a blogger before purchasing a paid ad on their site. If you only offer a tiny 50x50 ad in a sea of 800 other ads, I don't return. My swap ads are huge and I expect yours to be of similar size to what I am giving you. Pick a site with a similar (but not exactly the same) demographic as you. For example, my site probably would not do so well on a blog about politics, or gardening. I tend to advertise with fashion, DIY, christian and/or lifestyle bloggers. I try not to advertise with other etsy shop owners who sell similar items as me--that's just not fair to them or for me. Who do you advertise with? Do you pay for it?